How negative can interest rates get? On 11 June 2014, the European Central Bank decided to set a negative rate on deposit facilities and on the excess reserves held by credit institutions in the euro zone. This rate was then lowered several times, and has been -0.40% as of March 2016. This raises questions about the reasons why agents, in this case the commercial banks, agree to pay interest on deposits left with the ECB. In an article on the causes and consequences of negative rates, we explain how the central bank has come to impose negative rates and how far they can go, and then we discuss the costs of this policy for the banks. To conduct its monetary policy, the ECB requires commercial banks in the euro zone to have an account with the Bank, which is used to meet the minimum reserve requirements and to participate in operations to provide liquidity. This account can also be used to perform clearing transactions between commercial banks. The required reserves are remunerated at a rate set by the ECB. Beyond this amount, in normal circumstances the banks do not receive any other compensation. Moreover, the ECB also provides a deposit facility allowing the banks to deposit cash with the ECB for a period of 24 hours, with remuneration paid at a deposit facility rate. Prior to 2008, the commercial banks held only the reserves that they needed to meet the minimum reserve requirements (see the graph). Any stock of excess reserves was very small: less than 1 billion euros on average until 2008. The same was true for the balance of deposit facilities, which was 321 million euros on average. Since the crisis, the ECB has replaced the interbank market and has intervened to provide a large amount of liquidity. Through the banks’ participation in various ECB programmes to purchase securities (quantitative easing, QE), they also receive liquidities that are placed in their reserve account, to such an extent that by September 2016 the accumulated stock of excess reserves and deposit facilities reached 987 billion euros. 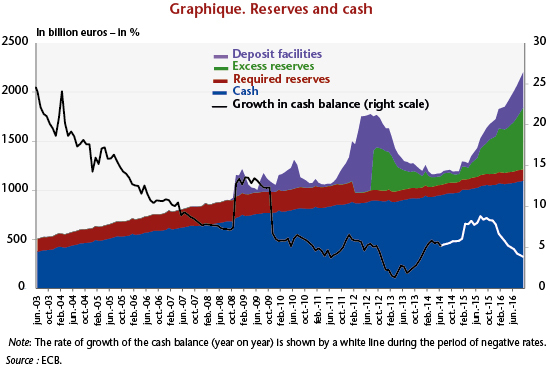 The negative rates do not apply to all monetary policy operations but only to the portion of the cash left on deposit by the banks (total assets of the euro zone banks are 31 trillion euros). At the current rate, the direct annual cost to the banks is thus 3.9 billion euros. Given that the banks are not required to hold these excess reserves, it is reasonable to ask why they accept to bear this cost. To answer this question, it is necessary to examine the possibilities for trade-offs with other assets that could be used as a substitute for the excess reserves. The reserves are in fact money issued by the central banks solely for the commercial banks and are therefore a very liquid asset. But the rates on the money market are also negative, to such an extent that it is a matter of indifference to the banks whether they have excess reserves and place their liquidities on the interbank market for a week or buy Treasury securities issued by the French or German government, for example, with yields that are also negative. Actually, the best substitute for the reserves would be to hold the cash directly. The substitution could therefore take place within the monetary base if the banks called for the conversion of their excess reserves and deposit facilities into cash, which has the same properties in terms of liquidity and zero nominal interest. Currently this would mean converting 987 billion euros of reserves into banknotes, nearly doubling the amount outstanding, as the volume of notes in circulation in September 2016 was 1,096 billion euros. The fact that these agents can have an asset that is not interest-bearing is the argument for why nominal rates cannot be negative. In practice, because there are costs to holding currency in the form of notes, this trade-off does not take place when the threshold for negative rates is exceeded. The nominal rate can therefore be negative. It is clear however that there is a threshold at which holding cash would be preferable. The cost of holding large amounts of cash is not known precisely, but it seems that it is not insignificant, and in any case is higher than the 0.4% currently charged by the ECB. It seems that in practice there has not yet been any such substitution, since the volume of outstanding notes in circulation has not risen particularly since negative rates were first set (graph). Jackson (2015) has made an assessment indicating that the various costs of holding money in the form of notes and coins could be up to 2%, which would act as an effective lower bound (ELB) for a reduction in rates. Beyond the costs that negative rates represent for banks, the expected benefits of such a policy need to be considered, as well as the overall context in which they have been set. Together with negative rates, the ECB is using its targeted long-term refinancing operations (TLTRO II) to enable the banks to finance themselves at negative rates, and is thus urging them doubly (via the cost of their excess reserves and via the rate at which they are financed) to grant credit to the real economy. Credit institutions are in practice required to leave reserves in this account in the amount of a certain fraction of deposits collected from the non-financial sector. See here for more details. Amount of reserves beyond the required reserves. Together with the banknotes issued, these form what is called the monetary or money base, M0. ← Does central bank optimism move financial markets?